Transform your skin’s appearance with the Mask Away Set from Omorovicza. 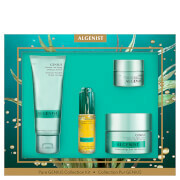 Presented in a branded box, the skincare collection combines three high-performance products that work in tandem to cleanse, exfoliate and refine. Harnessing the purifying powers of mineral-rich Hungarian Moor Mud (derived from the largest thermal lake in Europe, Lake Hévíz), the luxurious cleanser delivers a deep pore cleansing action; effectively dissolving dirt and makeup to reveal a smoother, more refined appearance. A cooling blend of Camphor, Peppermint and Eucalyptus Essential Oils leave skin feeling soothed and revitalised. An intense cleansing treatment that works to revitalise, decongest and brighten your complexion. Enriched with Hungarian Moor Mud sourced from Lake Hévíz, the second largest thermal lake in the world, the mask draws out dirt embedded in the skin to minimise the appearance of pores and even out skin tone. Its Hydro Mineral Transference™ System delivers minerals into the deeper layers of skin to reveal a firmer, more supple complexion. Cream Cleanser: Apply a pea-sized amount to damp skin and massage in circular motions before rinsing thoroughly with warm water. Avoid contact with eyes, cannot be used to remove eye makeup. Cream Cleanser: Aqua (Hungarian Thermal Water), Caprylic/Capric Triglyceride, Glycerin, Cetearyl Ethylhexanoate, Silt (Hungarian Mud), Theobroma Cacao (Cocoa) Seed Butter, Stearic Acid, Cetearyl Alcohol, Cetearyl Olivate, Sorbitan Olivate, Saccharomyces Ferment Extract, Zinc Oxide, Phenoxyethanol, Ethylhexylglycerin, Disodium EDTA, Tocopherol, Parfum (Fragrance), Eucalyptus Leaf Oil, Mentha Piperita(Peppermint) Oil, Phospholipids, Xanthan Gum. I am so pleased with this cleanser! It smells amazing and I feel like it has made a difference in my skin. Very pleased to have it. It is doing it's job. Silk moisturiser face amazing face mud mask.